Palestinians and their supporters take to social media to celebrate deadly attack on innocent Jewish family in Jerusalem. A Facebook page set up in honor of the Palestinian terrorist who murdered two people and injured three others - including a mother and her two-year-old baby - has already gained more than 2,000 likes. 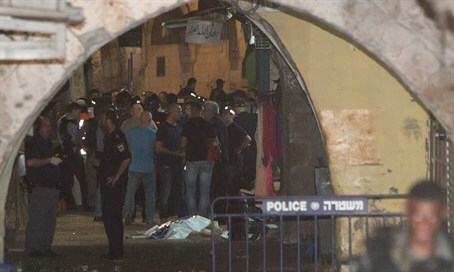 19-year-old Islamic Jihad terrorist Mohammed Shafik Halabi attacked a young Jewish family in Jerusalem's Old City, repeatedly stabbing the parents and their infant child before snatching another civilian's weapon and firing on police and tourists in a frenzied attack. Border police reacted quickly to the attack and shot him dead. As usual, Arab support on social media and on the street flooded in for the brutal murders, including in the form of a Facebook page set up in his memory just a few hours after the attack. The page features pictures of Halabi along with various slogans in support of his crime, many of which have received hundreds of likes. One day before the attack, Halabi himself had taken to Facebook, ominously declaring: "the third intifada has already begun."